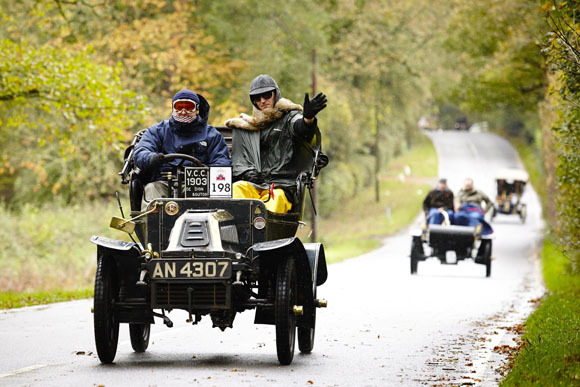 As dawn breaks on Sunday (1 November) more than 400 drivers and their hardy passengers will deal with whatever the weather has in store to drive 60 miles from London to Brighton. 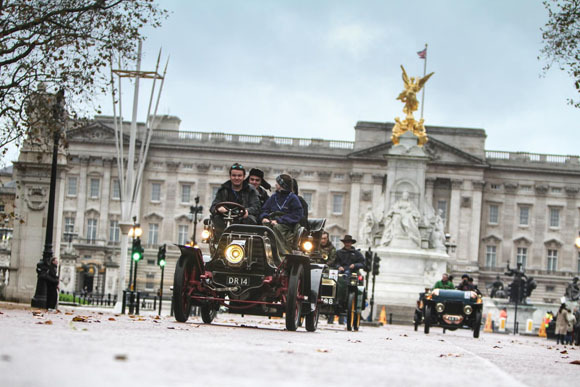 They will be at the wheel – or the tiller – of hundreds of horseless carriages, many of which were built while Queen Victoria was still on the throne. 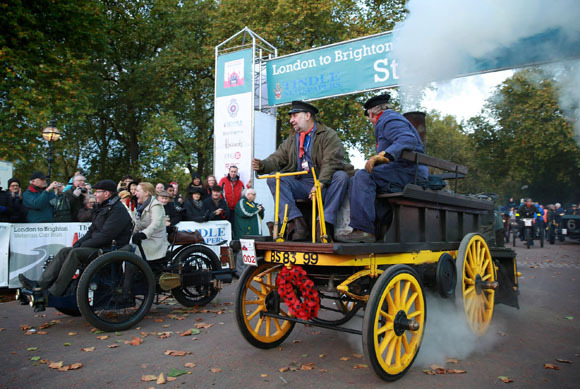 As well as cars powered by petrol and some by steam, there will also be a few battery-powered electric vehicles taking part in the Bonhams London to Brighton Veteran Car Run. The first car will leave Hyde Park at 06.54 on Sunday and for the next couple of hours a huge variety of three and four wheel veteran cars will stream down Constitution Hill, alongside Buckingham Palace and on to The Mall before heading through Parliament Square and past Big Ben on their way to the coast. The Harrods Stop at Crawley, the official half way point, will provide a welcome refreshment break. 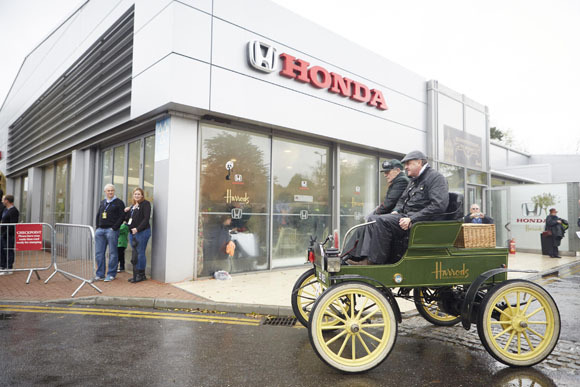 Honda will be emptying its forecourt and service bays of modern cars to allow drivers to work on their veterans with assistance from RAC Motoring Services and Total. There are ample viewing opportunities along the way, notably in Crawley High Street where a knowledgeable commentary team will give some background on the veterans on their passage through. 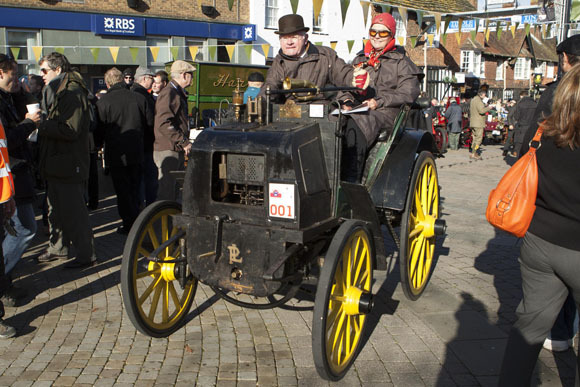 In addition a time control check has been established which will provide the perfect opportunity for photos as the cars stop to have their cards stamped. The first cars are expected to pass through Crawley from 08.15 with the last leaving at about 13.45. Brighton expects its first arrival just before 10am with the last finishers ‘putt-putting’ in at 4pm. 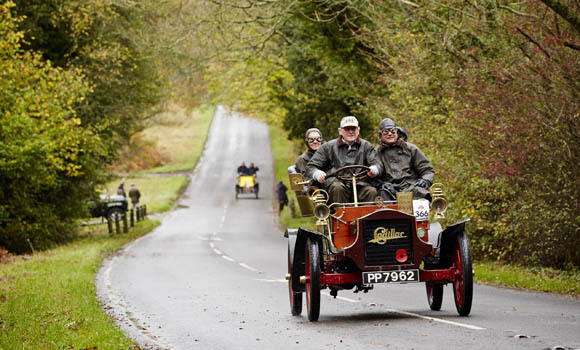 This year’s Run has an American theme, with a celebration of US car marques – it is anticipated that one in four cars on the Run was built in America. American marques taking part will be familiar names like Cadillac, Ford and Oldsmobile alongside less well-known names such as Pope, Waverley and Northern. And it’s a similar story as far as European marques are concerned. 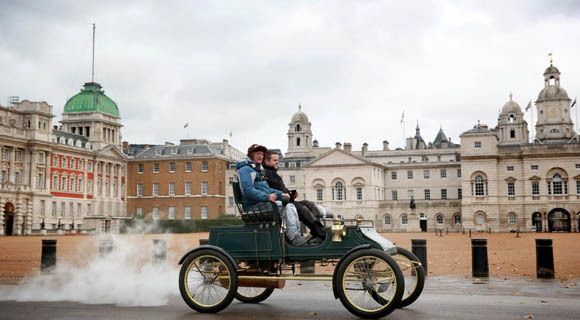 Renault and Vauxhall, both Manufacturer Patrons of the Run, are entering cars from their own heritage fleets: the French firm is entering a 1900 Renault Type C while Vauxhall is entering two vehicles, a 1903 5HP, the second oldest Vauxhall in the world, and a 1904 6HP. Other familiar names include Peugeot and Benz but the rest of the field include long lost marques such as Bolide, Gladiator and De Dion Bouton. 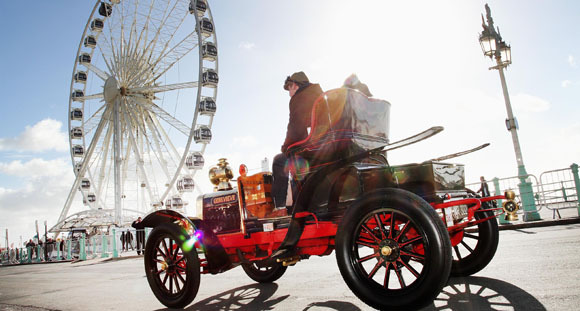 The oldest car on the Run is the 1888 Truchetet and one of the rarest is the 1901 Isotta Fraschini, the actual first car made by the Italian firm and which has never been seen in the UK before. There are some familiar names in the driving seats, too. Look out for former Grand Prix ace Jochen Mass, Pink Floyd drummer Nick Mason and F1 legend Ross Brawn. BBC DJs Chris Evans and Ken Bruce, along with Alex Jones and Zoe Ball, will be following the Run in two vintage buses, each filled with successful bidders who together raised almost £350,000 for BBC’s Children in Need.